Just a quick note regarding a 64GB Sony USB Memory Stick which we recently purchased which turned out to be a fake. 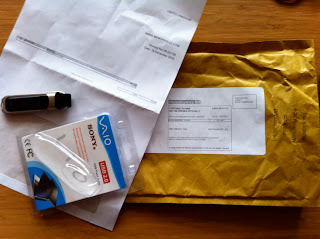 We did not buy the unit in China (given the potential issues of quality control) but purchased from a USB memory stick seller based in Jersey ... unfortunately, they are selling fake USB memory sticks (at least, the 64GB Sony Vaio version we were sent is a fake). It seems that the USB memory sticks are less than 1GB in size and have been reformatted or 'tricked' into reading a 64GB capacity. This is the issue - when initially being used they appear genuine but the data write rate is very slow and when you try to read the data off the USB memory stick, it is corrupted. These are essentially useless, so stay well clear if you require a working USB memory stick. I have attached packaging of both the unit and from the seller for reference, so you can work out if you are being cheated. The company in question (although they seem to have closed all feedback on Ebay) is www.memorywizz.com - you have been warned!